GRAFENWOEHR, Germany (Nov. 01, 2008) -- At the Grafenwoehr Training Area in southern Germany, Soldiers train in a "shoot house" unlike any in the Army. The Joint Multinational Training Command, the Army's training arm in Europe, manages and maintains a one-story, 10-room, roofless building that sits beneath a massive cover from which high-intensity lights and video cameras hang. U.S. troops and coalition partners use the training facility to prepare for real-world missions downrange in Iraq and Afghanistan. It's like a movie set: lights, cameras, action. 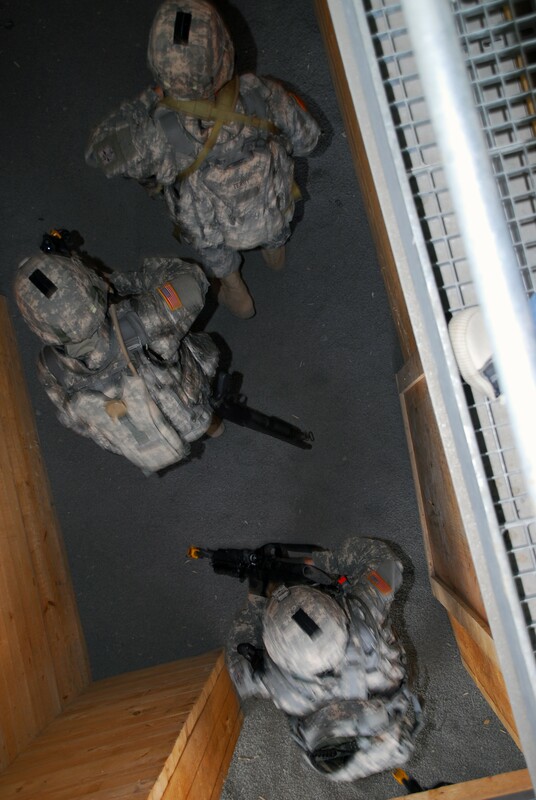 Soldiers enter the shoot house quickly, as they would during a real-world raid in Iraq or Afghanistan. Every second counts. Practice makes perfect. Soldiers prepare to gain entry by kicking down a door, or breaching the entrance using explosives. They shout orders to each other, room by room, with guns blazing. From above, the directors - commanders and training supervisors - stand on catwalks orchestrating proper movements. They coach, mentor and watch as their troops practice over and over again what they've been trained to do: secure each room one at a time, do it quickly, capture any high-value targets and make sure nobody gets hurt in the process. "The advantage to the catwalk is that leadership can look from up there and see how Soldiers are clearing the rooms and correct them on stuff before they go into live fire," said Sgt. Maj. Troy Nattress, director of training for the JMTC. "For unit command and unit leadership, the shoot house is a training aid. The commanders know their unit better than anybody else and what training they need to conduct. So we don't tell them how to train, but we assist them in meeting their training objectives." In the shoot house, Soldiers can perform dry runs without ammunition, or use either blanks or live ammunition. Observers are not allowed on the catwalks while live ammunition is being used. It takes just a minute before the shooting finally stops. Soldiers assess their performance, looking around at what they've shot to see if they've killed any non-combatants, and collecting anything that might be of value to the intelligence community, such as cell phones, laptops or documentation. Soldiers then get the low-down from their platoon leaders on how they did. Did they check their corners? Did they move fast enough? Could they have communicated better? Did anybody get shot who shouldn't have? After the training is over, they'll get an after-action review that features videos of them from above, moving into each room. No Soldier is safe from the camera's eye, in daylight or darkness. Each Soldier's performance is on display, and everyone can see exactly what they did right, and what they did wrong. After watching the footage, Soldiers are quick to adapt their actions so they can be ready for the next training session, or ready to do it for real in Iraq. "The best thing about the shoot house is the cameras," said Staff Sgt. Kevin Terry, with the 2-28 Infantry in Grafenwoehr. "The guys that are new come in and think they are doing good. But you come back and watch it on videotape and you see the small mistakes they make that would get somebody killed. And you see the places they can improve themselves by watching the videos, by clearing the corners - all the small things they don't see when they are doing it because they are in a hurry trying to clear the house and shoot the bad guys." The shoot house in Grafenwoehr is one of the most advanced, if not the most advanced in the world. For starters, it's a live-fire shoot house. Soldiers armed with real guns kick down the doors and fire real bullets - the kind that'll kill you - into the walls and into the mannequins that occupy the rooms. The walls are made of five layers: wood, steel, concrete, steel and wood. The steel and concrete keep bullets from penetrating the walls and hurting a Soldier in the next room. The outer wood layer, which needs regular replacement, prevents bullets from ricocheting off the steel walls and back at the Soldiers. In the rooms themselves are full-size mannequins wired to fall over when hit with a bullet. Each is tethered to control boxes in the rooms, located above the red "no fire" line. And each can be placed where needed to best simulate the kinds of training scenarios commanders want their Soldiers to encounter. "When they get hit they will fall," said Sgt. 1st Class Thorsten Lamm, a range control officer and infantry branch noncommissioned officer at the range. "What's awesome about these simulated targets is that when they fall, unlike a paper target, you have to get out of their way. It's not just a paper target, it's a body you have to deal with." Soldiers are expected to shoot only at the mannequins that are "armed." Those setting up the training can go in before each run through the shoot house and place a weapon into the hands of a mannequin if they want it to represent a hostile force. They can also remove a weapon already there if they want it to be unarmed. "If you hit him then, guess what? You go to jail," Lamm said. "Because he doesn't have a weapon." So Soldiers need to be on their toes in the shoot house. They must also remember to check fallen mannequins for cell phones, identification or anything else that might be useful in intelligence gathering. Day and night video cameras hang from the ceiling, keeping an eye on every room. They, along with the mannequins, are hooked into a separate facility where government contractors run the shoot house and after-action review. They record each iteration through the shoot house, trip the mannequins manually when Soldiers are using blank rounds, and choose the sound effects to play over the loud speakers during training sessions: a woman screaming, an alarm going off, the sounds of gunfire or the call to prayer in Arabic. In addition to being high-tech, the shoot house is also safe. No Soldiers have been killed there during training since its opening in October 2007. "When you go through and do a live shoot, all this is live, and all of it is safe," Lamm said. "I've been through hundreds of iterations since I started here and nothing has happened." The lessons learned there are meant to ensure that Soldiers know their jobs well enough to keep themselves alive when they go downrange - where every shot fired is meant to kill, the walls are made of plaster and wood, and the "mannequins" shoot back. 1st Lt. Keith Gauthier, with the 2/28 Mortar Platoon in Grafenwoehr, has been to Iraq before, and is preparing his unit to deploy again near the end of the year. He said he thinks what happens in the shoot house and at the other ranges at Grafenwoehr is helpful in getting his junior Soldiers ready for the fight. "We were in Baghdad for a lot of the urban combat and a lot of the houses where shooting happened," he said. "If I can just get our guys where we are working together, where we are not aiming at each other when we come in a room - to have muzzle awareness so they are not bringing up their weapon and aiming at a friendly - that'll help. And the shoot house helps with that." Terry said it's the realism of the shoot house that makes it so effective in preparing Soldiers to go down range. "The realism is the best part, and I think most people work better with the hands-on experience instead of people telling you," he said. "And with the cameras, when the guys actually see themselves mess up they can say they won't do that again - and that really helps."